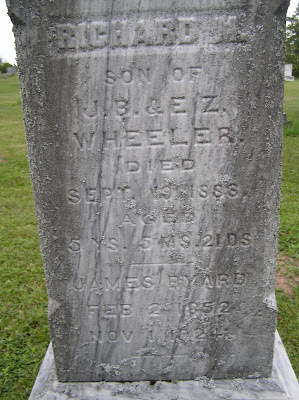 Richard Wheeler is the brother of my grandma Ethel Wheeler Raeburn, children of James B. and Elizabeth Z. Wheeler. Their first child Mae Matilda was born in Parry Sound, Ontario in 1879. They later moved to Schoolcraft County Michigan, the rest of the children as far as I know were all born in Seney, Schoolcraft Co Michigan. 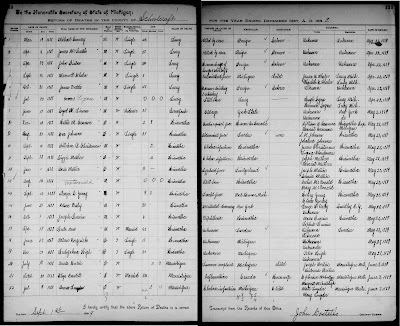 They haven’t been found on an 1880 U.S. or 1881 Canadian census, and of course forget 1890. This would put his birth date at March 20, 1883. No birth or death record found for him yet. The ‘family folklore’ is the middle name is McLean, named after his grandfather James McLean Wheeler. It has also been noted the [male] child died from choking on a peach pit- family lore again. 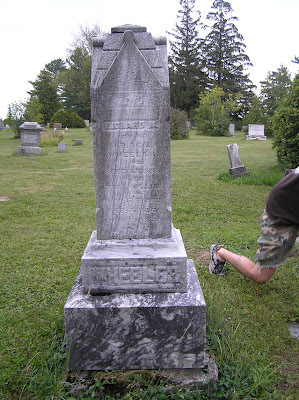 MAXWELL WHEELER died SEPTEMBER 18, 1888 in Seney, Schoolcraft Co Michigan, of intermittent fever at age 8, son of James B. & Elizabeth Z. Wheeler. This was recorded April 22, 1889. Maxwell born 1880 died Sept 18, 1888, Richard born 1883 died September 10, 1888. Only one death record-Maxwell, one stone- Richard M.
Oh lets not forget the icing on the cake, the stone for Richard is in Chippewa County Michigan, and they hadn’t moved there at that time. Well now, one son or two? Five years old or eight? Maxwell or McLean?! What’s wrong with this picture ?! !